This easy to make cheese stuffed pull apart garlic bread is perfect as a side dish for dinner. It’s also great for parties! It’s hard to pass up a delicious serving of cheesy garlic bread and this recipe is no different! This bread is stuffed with mozzarella cheese and topped off with delicious flavors of butter, oregano, garlic, and parsley. It also has sprinkled mozzarella and Parmesan cheeses on top of the delicious butter baste – if you love cheese, you’ll love this! Since this recipe uses yeast, it’s important to make sure you’re using it the correct way! To active the yeast, it needs to be warm in your home. If it’s not warm enough, the dough will not rise and double as it should. Personally, my kitchen is rather cool and when I use dry yeast in the cooler months, I place my bowl near my fireplace for warmth. If you don’t have a fireplace, find a warm spot in your home and let it sit for the hour it takes to rise. It’s also important to use warm water to activate your yeast. If you use cold or hot water, it will cause your yeast to die and your bread will not come out right. Once you get a hang of dealing with dry yeast, it’s not so scary and you will find it’s pretty easy to use! 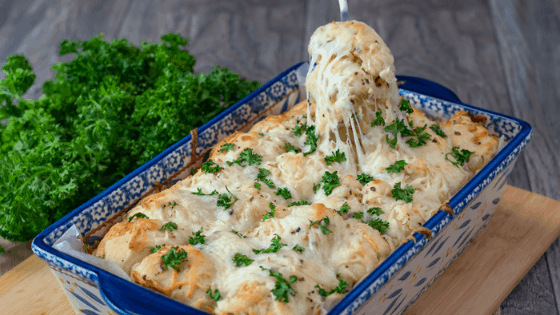 Pull Apart Garlic Bread stuffed with mozzarella cheese and topped with cheeses and parsley. In a large bowl, mix together 1 cup of WARM water, 2 tbsp of sugar, and the 2 tsp of yeast. Allow the mixture to sit for about 10 minutes. It will become foamy. After the yeast is ready, mix in the 2 tbsp of softened butter, followed by the cup of milk, 1/2 tsp of onion powder, and the 2 1/2 tsp of salt. Add in 2 cups of the bread flour and then slowly add in the remaining two cups. Knead dough until it bounces back and is not sticky. Cover and sit in a warm room for about an hour to allow the dough to double in size. After the dough has doubled, pinch off a two-inch ball and place a mozzarella cheese square in the center. Wrap the dough around the cheese, making sure to pinch the ball closed. Place in the baking dish repeat until all the dough used. Melt 1/2 cup of butter and add in the oregano, garlic cloves, and salt. Using a pastry brush, spread evenly over the entire baking dish until it is all used up. Sprinkle the mozzarella cheese and the Parmesan cheese evenly over the dish and top with the fresh parsley. Bake for about 30 minutes and remove from oven to cool. This pull apart bread looks so gooey and inviting. Love the flavours here – garlic + mozzarella is a killler combo always!